B.A., M.S. in Zoology, Univ. Washington, graduate emphasis: marine invertebrate zoology; Fulbright fellow, Danish Marine Biological Laboratory; Ph.D., Biological Sciences (Stanford), research done at SU’s Hopkins Marine Station; Specific ocean or education research areas: larval development and recruitment biology of marine invertebrate animals. Grade levels taught: university undergraduates and graduates. Outreach experiences, etc. 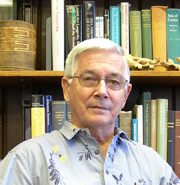 : Many public lectures, e.g., Waikiki Aquarium program; director of program for Pacific Island students in NSF’s Undergraduate Mentoring in Environmental Biology (UMEB) program. 1.) Zabin, C. J., J. Zardus, F. B. Pitombo, V. Fread and M. G. Hadfield. 2007. A tale of three seas: consistency of natural history traits in a Caribbean-Atlantic barnacle introduced to Hawaii. Biological Invasions 9(5): 523 - 544. 2.) Pettengill, J. B., D. E. Wendt, M. D. Schug, and M. G. Hadfield. 2007. Biofouling likely serves as a major mode of dispersal for the polychaete tubeworm Hydroides elegans as inferred from microsatellite loci. Biofouling 23: 161 – 169. 3.) Zardus, J. D, B. T. Nedved, C. Tran, Y. Huang and M. G. Hadfield. 2008, Microbial Biofilms Facilitate Adhesion in Biofouling Invertebrates. Biological Bulletin 214: 91–98. 4.) Erickson, P. B. and M. G. Hadfield. 2008. Isolation and characterization of eight polymorphic microsatellite loci in the endangered Hawaiian tree snail Achatinella sowerbyana. Molecular Ecology Resources (doi: 10.1111/j.1471-8286.2007.02071.x). 5.) Nedved, B. T. and M. G. Hadfield. 2008. Hydroides elegans (Annelida: Polychaeta): a model for biofouling research. Chapter in: Marine and Industrial Biofouling, H.C. Flemming R. Venkatesan, S.P. Murthy, K. Cooksey, Eds. Springer, Berlin (in press).